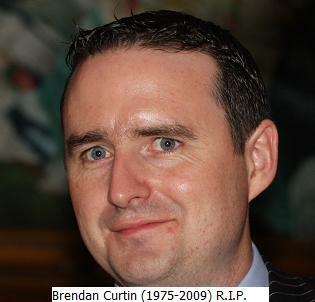 The sudden and untimely death of Brendan Curtin at Tallaght Hospital on the 10th July, 09 came as a great shock to those privileged to know him. Brendan who was only thirty four years of age was the youngest member of John and Bernie Curtins family of four boys and three girls. Death is always sad but when it strikes at one in his prime having such a promising future it is particularly poignant. Though Brendanâs life was relatively short he lived it to the full and had achieved much. When Brendan was born his family lived in Cappaghmore Estate in Clondalkin and he attended St. Josephâs primary school there. As a juvenile he played Gaelic games with the Round towers Club. His family came to live in 15 Ardglass, off Sandyford Road, Dundrum in 1985 and Brendan attended Holy Cross National School in Dundrum. He attended St. Benildus Secondary School. Having secured a degree from U.C.D he subsequently studied and qualified as a Chartered Accountant. He took up employment with KPMG and he also worked for O2, before moving to Meteor, where he was employed at the time of his death. Brendan married Gwendolyn Marks form Cooley Co. Louth in December 2006 and they lived in Naas, Co. Kildare having purchased a home there. Having come to live in Ardglas Brendan transferred to Naomh Olaf GAA Club where he became valued and much loved member. He made a major contribution to the club, as a player, team mentor, Senior Committee Member and Club treasurer. While employed by O2 he secured valuable sponsorship from his company for the Naomh Olaf Senior Football team.As a mark of respect to Brendan all Naomh Olaf GAA fixtures were called off on the weekend of his death. Brendan was a man of honesty and integrity and this together with his exceptional good looks made him a an ideal choice to represent his Company KPMG as an independent observer of the National Lotto Draw live on RTE on many occasions. Brendan had many interests. He was an avid reader. He played Gaelic games and supported the Dubs. He supported the Munster and Leinster Rugby teams. He was a good cyclist and raised money on several occasions cycling for his favourite charity, the âWelcome Home Foundationâ. If itâs true that thereâs more joy in giving than in receiving then Brendan must have enjoyed a very happy life indeed. A person like Brendan with so many diverse interests made many friends, all of whom now have their own memories and stories.Many lives have been enriched by Brendanâs life, none more so than that of his wife and his family. His passing has left heartfelt pain which will only case with the passage of time. His funeral was a true reflection of the respect and affection in which he was held. A large number of people all united in grief travelled from far and wide to pay their prayful respects. Brendanâs funeral mass was celebrated in St. Conlethâs Church Newbridge on the 13th July 09. Members of Naomh Olaf GAA Club formed a guard of Honour as his coffin draped in the Naomh Olaf Club flag was received into the Church. Fr. Pat Hughes who was the celebrant is to be commended for his moving and meaningful imput to the funeral liturgy. SeÃ¡n Curtin gave the Eulogy in which he described his brother Brendan as âa rare specimen, an accountant with a personalityâ Brendanâs burial took place afterwards in Cill Mhuire Cemetery, Templetown, Cooley, Co. Louth. It is not within the narrow limits of his brief appreciation, but rather in the hearts and memories of his beloved wife, family and friends that his many merits and virtues will be indelibly recorded. Sincere condolences are extended to his wife Gwendolyn and her family, to his mother and father John and Bernie, his brothers and sisters, SeÃ¡n, David, Deirdre, Collette, Kevin and Bernie and to his many relations, neighbours and friends.